To use C#.NET RasterEdge XDoc.HTML5 Viewer on IIS, C# users should make some preparations for file viewing and manipulating on HTML5 document viewer. This page will navigate users how to deploy HTML5 Document Viewer on IIS. In order to reduce the size of SDK package, dlls are not put into Xdoc.HTML5 ViewerDemo/Bin, all dlls can be found under RasterEdge.DocImagSDK/Bin directory. Copy according dll files listed below under RasterEdge.DocImagSDK/Bin directory and paste to Xdoc.HTML5 ViewerDemo/Bin folder. 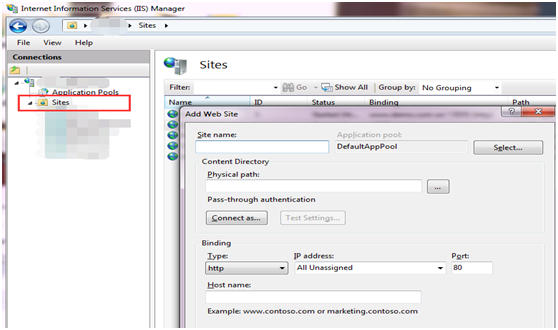 Click Application Pools, choose Set Application Pool Default on the right. Set .NET Framework Version and Enable 32-Bit Applications. Please set Enable 32-Bit Applications property as ture when you use x86 dlls, or select false if not. Note: An error may occur when you first upload file: Information error, please re-open this file. It’s caused by two reasons: pageCount is 0 or pageSize is null. This error will disappear when you reopen this file.